I am not sure if many people have heard of this race 🙂 🙂 but on the 4th November 2018 I got to experience something so special and memorable that I will never forget and have decided to write this report as a result. Prior to my departure for this race I soaked up as much information I could get from the Goodwin’s and I owe them great thanks for this as it turned out invaluable. Thank you very much both, it was gratefully appreciated. So where does one begin……. Prior to joining Massey’s, running and as a much heavier Gary I was always obsessed with Marathon running and to this day see Haile Gebrselassie as one of my greatest heroes. I took the opportunity to read his biography on the plane and learned about his disappointment of never winning New York thinking to myself first the Goodwin’s now Selassie this race must be something big. As a result of my nerves for the big day on Sunday I made the conscious decision not to run the 5km on the Saturday, seeing the crowds and buzz on the streets on Saturday I can safely say that this is a race not to be missed for anyone fortunate enough to make this event in future, I instead decided to leave my number collection for the Saturday and spend the morning at the expo oh and I was very glad I did this. 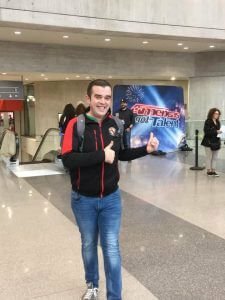 As Saturday morning came, I woke up early to make my way down to the Javits centre for the expo, as soon as I entered, there it was my first potential selfie of the day, American Idol auditions. Those who seen my exquisite dance moves at the 40th anniversary party would understand who difficult it was for me to pull myself away from auditioning but I was a man here for a purpose, time to get my head in the game ;-). The expo was incredible, number and t-shirt collection was smooth and easy and plenty of opportunities for photos as well. After number collection you have to go through the New Balance merchandise shop before you get to the main expo hall, it was hard but I picked up a lot of merch 🙂 :-). 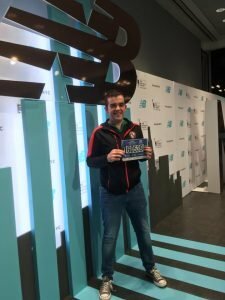 After passing through the tills and having the servers at the checkouts sing me a song as it was my first marathon, we entered the main expo hall and then it happened. I have heard someone say that you should never meet your heroes as you will always be disappointed. I would say you should always meet your heroes. I glanced across the expo hall and standing, standing right in front of me was my hero Haile Gebrselassie and what a gentleman he was. After a ten or so minute chat with him, we took a photo and he wished me well for the 26 miles ahead of me the next day. A good few hours was spent going through the various sections of the expo, I headed back to Fifth Avenue to meet my family and to start the carb loading process. I joined my family and friends at an Irish bar on the Saturday evening for some grub and to try and calm the nerves down. As I finished the first course I decided to take a break. Upon return to the table, I got the biggest shock of my life all I heard was “alright Phil what’s the craic?” to look up only to see my sister from Melbourne Australia standing right in front of me. It made me feel so special and the support from my family and friends last Sunday is something that I will not forget. I quickly excused myself from the pub for an early night, those who don’t know the marathon in New York has an early start due to the logistics of getting the Staten Island for the start, so with a 4.15am alarm set I put the head to the pillow and hoped for a couple of hours of sleep. The Sunday morning wake up was a bit bad!!!!!!!!!! !, I packed my bags and headed to the hotel reception to meet some fellow runners I had met at the hotel previously to walk together to Bryant park to catch the bus to the race start. Due to security measures and a couple of checkpoints it took us about two hours on the bus to make it to the starting village. As I queued up at the security gates, all I heard was the loudest bang which resulted in a lot of people to jump, then I remember one of the tips Dave Goodwin passed to me and let fellow queue goers know that it was the starting gun and not that we were being attacked as that was what we all thought. The start villages was broken down to four different villages that were to match the colour on your bib. I was blue wave four which resulted in me having an 11.00am start. The village itself catered for all needs with endless supply of water and food to keep you going until your quarrel was called and of course the therapy dogs to calm the nerves. My wave was called at 10.30am, so I quickly threw my excess clothes into the provided goodwill bins and made my way to my allocated quarrel passing the final number check at the gate, I quickly realised that there was no turning back, the only exit for me was the finish line at Central park. 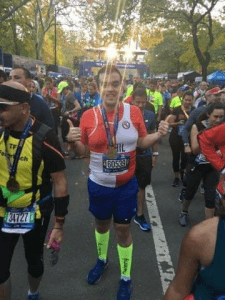 As we were walking to the start line at the bottom of the Verrazano Bridge, the buzz and the atmosphere in the crowd grew, this was happening Phil (Gary) McCarron was part of this day, he was about to run the New York marathon. The cannon shot fired, Frank Sinatra was playing and I was running the New York marathon. For those who don’t know, the big feature of this marathon was that you would run through the city’s five boroughs (Staten Island, Brooklyn, Queens, The Bronx, and Manhattan). Starting the climb to the top of the Verrazano Bridge I quickly realised that this was going to be a hilly sorry undulating 😉 course. As I got to the top of the bridge I was greeted to most magnificent view of the Manhattan skyline it was breath taking which was quickly followed by a nice downhill into Brooklyn. The marathon makes a statement in welcoming runners into each borough and the crowds at the bottom of the bridge at the entrance to Brooklyn were so noisy that they would have challenged the Massey support crew at today’s cross country. It was an absolute joy running through Brooklyn (Approximately 14ish miles). Runners were greeted by different cultures and music genres as we made our way through the streets, to go from hip hop music to a gospel choir and a kinks tribute band in the space of three stretches was something that everyone appreciated and lived up. Brooklyn went by in a flash (we will not talk about mile 8 in this report) and we were quickly welcome by silence on mile 16, dead silence, being on the undercarriage of a bridge into Manhattan with the only noise being other runners pants and footsteps I found very difficult to deal with but the almost overbearing noise as you left the bridge and entered first avenue Manhattan meant that this down period was quickly forgotten. The first stretch of Manhattan into The Bronx went by in a flash, it was such an overwhelming stage of the marathon with the crowds and my various family members being positioned along this stretch meant so much to me and was exactly what I needed at this point in the race. Then another bridge came, this wasn’t a nice bridge, it wasn’t the widest and a lot of fellow runners were walking which this very difficult mentally. I was feeling it very bad at this point, I knew I had hit the infamous block, I could not get my legs moving as fast as I wanted, I thought was not going anywhere and the emotions were getting to me, I needed to do something. Facebook live time. I would just like to say a massive to all for your positive messages at this point it was exactly what I needed. Found a gap in the crowd and I got myself moving. The journey through The Bronx went quite quickly, I got my head down and I kept one foot going after the other. Mile 20 to 22 quickly flew past, we were being back in Manhattan and on the final stages of the road to Central Park. Fifth avenue was the last section prior to the central park entrance, if anyone thinks NYC is flat they should take a walk up this road as this uphill stretch lasted for ten blocks and genuinely felt like you were doing a Kenilworth road bus stop hill rep it never stopped. I used the crowd support to get me up and the McCarron cheering squad at mile 24ish was all I needed, I slowly plodded along and I got to the top. Although it turns out central park is hilly as ****** (sorry not undulating, HILLLLLLLLLLLLYYYYYYYYYYYYYYYYYYY) I was in a zone and kept plodding along to the 800 meter to go sign. This was when the emotions hit for me, the guy that thought he never could, actually can. As mentioned previously in my pre-running life I was always a massive marathon fan but always would laugh at the possibility of doing a marathon but I had almost done it, I was going to run a marathon, as cringy as it may sound I absolutely broke down. I kept running but could not control the emotions. A kind lady (fellow runner) put an arm around my shoulder grabbed my hand. As she let go, I could feel a bit of paper in my hand, I opened the paper and it said “you can do it”. This gesture meant more to me than that lady will ever know. I picked my head up looked forward and kept going. As I turned the last uphill corner, I could see it in front of me, the finish line, I had done it… I left my hands above my head and soaked in the last few steps of this epic journey, I was a marathon runner, I had done it. A medal was placed over my head, it was all real, and I had done it. Marathon completed. Anything is possible. For those who got this far in the report, if you are wondering. I caught up with the lady who handed me the note after the finish line. She was a lady from London who had run her second marathon in New York last Sunday. She went through the same emotions I had when she did her first marathon (the London marathon) went a lady passed her the same note that she handed to me. Ladies and gentleman of the Liverpool marathon 2019 get ready the note is coming one of your ways. So what is next???? To para-phrase the famous ultra-runner Nikki Kimball I do not know where the cap in my potential lays so I am just going to keep on running and that is why I run.